Added on December 7, 2014 by Victoria Johnstone. Livewire is a large group of highly experienced consultants who specialise in communications for the pharmaceuticals industry. We were introduced to Lucille Weinberger, founder and CEO, by an existing client and quickly established a good working relationship which led to the opportunity to rebrand her company. Lucille has a great enthusiasm and can-do attitude, taking her company from a kitchen table start-up to one with a million pound+ turnover in an impressive five years. She is personable and to the point, highly principled and committed to treating her staff, be it freelance or employed, as part of a large extended Livewire family. We began with a brand workshop ran by ‘brand maker’ Neil Stewart, a natural story teller who we collaborate with often. The workshop helped pinpoint what makes Livewire different and created the proposition ‘intelligent communication’ based on their bright and flexible people. This gave us our creative starting point and pushed our exploration – always the fun part! After presenting a number of options our ‘Neon’ concept came out top. It worked brilliantly to communicate the ‘bright’, ‘live’ and ‘switched on’ Livewire personality in a contemporary and eye-catching way. 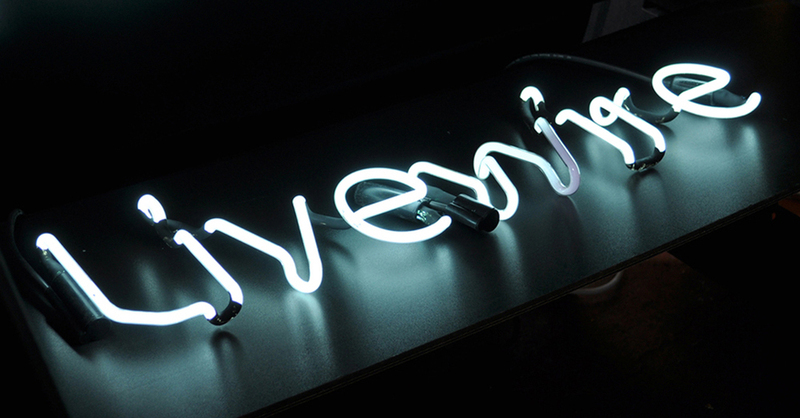 We translated the neon logotype into a range of media including print, digital and signage, commissioning two neon artworks for the Livewire head office by Electro Signs in East London, famous for their God’s Own Junkyard neon signage exhibits. A set of quirky glowing characters gave the website we designed a human and non-corporate feel, important to make sure Livewire stand out from their more staid competitors. We involved Livewire at every step, a process which took almost three months resulting in a refreshed brand identity, website, signage, stationery, launch materials and enewsletter. Lucille has a great way with people, building lasting relationships with her clients, staff and us! The strong, cohesive brand we created together truly reflects her personality. Their future is looking very bright. Lucille Weinberger: 'SALT are great at coming up with ideas, and then going on to execute them effectively and professionally. In addition the whole process ran smoothly, and from our perspective, effortlessly. I would recommend SALT to anyone wanting a distinctive and elegant branding look for their company or product'. Neil Stewart: 'Most designers are so preoccupied with what it looks like, they tend to ignore what it is actually communicating. SALT think as well as design, which helps immensely when you are working with a brand concept instead of a logo and trying to develop it visually'. See more of the project on the SALT website.